An important list of great books, all impeccable resources that will lead you to a multitude of other vital books, too many to mention here. 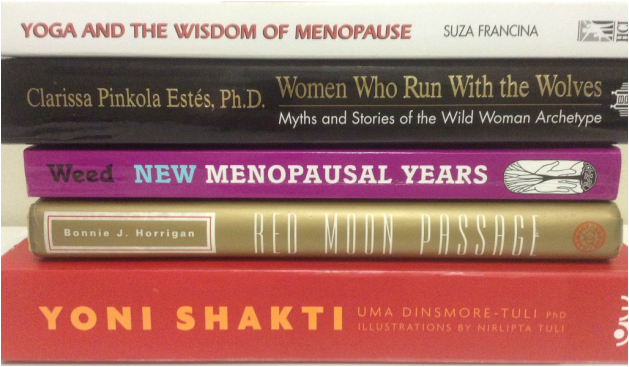 The defining therapeutic yoga guide book for women crossing the bridge to menopause and beyond. A classic for every woman's book collection. By the time we reach our 50's we may now realize that archetypes are real and do exist. Clarissa helps us on our way to rediscover beloved fairy tales so we may appreciate their true meanings, ourselves and our experiences with a whole new depth of perception that brings us into the place of knowing, to heal and connect with the Wild Woman archetype and our own wisdom and live in our power. The queen of herbs, Susun Weed's revised and expanded comprehensive book known as "the menopausal bible". Abundant wise woman herbal remedies, words of pure wisdom and so much more. If you are craving, green, earthy, grandmother guidance and wisdom, this is your book. Feeling the need to gather with a group of amazing elder's and wise women, who share their experiences and intuitions about the passage to power? Look no further, curl up with this book and let them come to you. Perhaps the most significant book written about this subject. Click here to sample some of the great wisdom from this book. Powerful and freeing wisdom for all women whether they practice yoga or not. Nourishing and nurturing womb yoga instruction and one of the best resources out there for women at all stages of life with lots of insight into the great initiation that menopause can be.